Photo by Mark Hallum A daycare could be sharing a lot with a storage facility in Glendale if CB5 and the BSA approve a special permit. Community Board 5’s Land Use Committee heard arguments Tuesday night for a special permit application with the Board of Standards and Appeals for the construction of a daycare center in Glendale. An attorney representing the developer appeared before the committee on Feb. 5 at the board’s Glendale office to answer questions regarding the safety of the children who will be taken care of at the location. Nora Martins, the attorney representing CS Cooper Avenue LLC, assured the advisory body that the operators of the proposed facility at 79-40 Cooper Ave. would protect children from not only the industrial activity surrounding the lot they hope to build on, but will take responsibility for keeping them safe in the event that the city Department of Homeless Services (DHS) places a shelter nearby. The surrounding area is no stranger to construction as of late. The adjacent lot is undergoing a transformation into a self-storage building and, down the road, 78-16 Cooper Ave. has been in a tug-of-war between the city and Councilman Robert Holden over a proposed homeless shelter or a public school. A new zoning text amendment to allow special permits for hotels in M1 districts could make it easier for the DHS, according to one source, to house homeless at the 78-16 Cooper Ave. site, which has a pending application with the city Department of Buildings to include a “transient lodging house” in a permit filed in August. DHS stated in a Jan. 15 email to TimesLedger that although up 9,900 of the homeless population being sheltered in Queens, it is currently phasing out the practice of lodging the 46 percent of them in commercial hotels. The 83,000-square-foot lot, which also encompasses the storage facility, needs a special permit to operate a mixed community facility and commercial retail space under the current M1-1 zoning, but Martins wants to use a special permit mechanism from the BSA which allows daycares in these zones under some circumstances. Just across the street from the proposed daycare is R4 zoning and although the daycare is private, they will offer Universal Pre-K, Martins said. 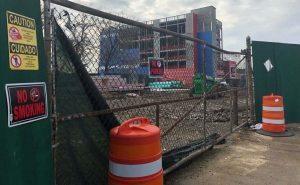 Children of America will oversee about 167 children in 15 classrooms of the proposed facility which be a total of 15,212 square feet and will have a fenced rooftop playground. About 3,986 square feet of the building will be used as commercial floor space that can be subdivided into smaller tenant spaces which the developers hope will attract a medical facility. Martins, a land-use attorney who last year represented the Sun Equity in its controversial effort to built retail space for Target with housing in Elmhurst, said they will provide more than the required parking with 32 spaces and a special driveway off Cooper Avenue for drop off and pick up areas. They do not anticipate any major traffic impacts. The five-story storage facility and daycare will not share the same vehicle entrance. Children of America currently has daycare facility in Jackson Heights and Queens Village, and hope to not only expand into Glendale but Bellerose as well. Board 5 will examine the matter further during a presentation at the board’s next public meeting, on Feb. 13 at Christ the King High School in Middle Village. The session begins at 7:30 p.m.